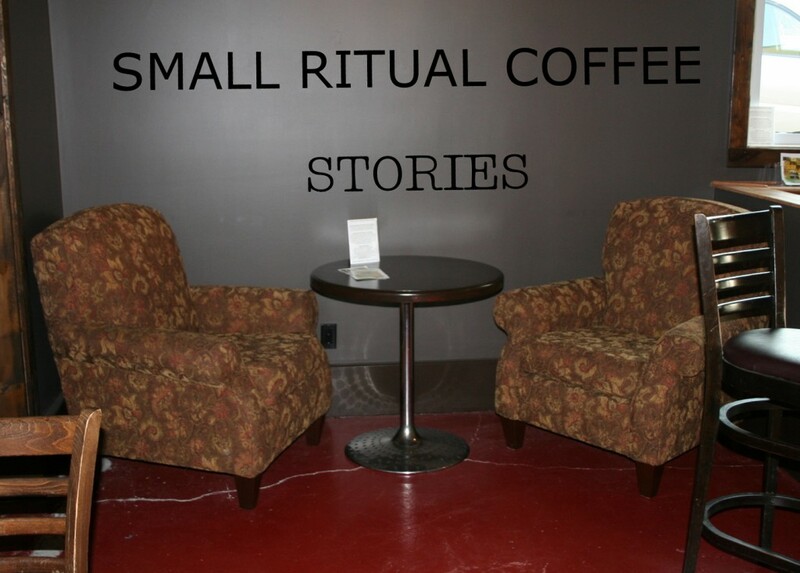 When entering the coffee shop, you notice tables, chairs and general coffee shop paraphernalia.Â What most will not realize is that almost every piece of furniture tells a story about Small Ritual’s journey. When we began talking about what the coffee shop would look like, we all had a vision in our heads.Â The team of “designers” had very high standards and expectations.Â Finding furniture that fit our vision on a tight budget was difficult to say the least.Â Hours were spent driving to different stores, taking pictures of various pieces, calling dealers and constantly browsing Craigslist. There was one item that kept me on Craigslist for many hours. Because I am a mom, the furniture outside the kids’ play room was really important to me.Â I wanted a cozy space for caregivers to sit and relax.Â We hadn’t found anything for that space two weeks before we opened and we were coming to the end of our furniture budget.Â I just couldn’t find anything under $300 a chair — and I had been looking for months. One morning I found a listing on Craigslist that immediately caught my attention.Â A woman in South Surrey (yay, I wouldn’t have to drive too far) had three gorgeous, cozy chairs that would fit perfectly.Â The only problem was the price.Â I decided to go out on a limb and let her know that we were a non-profit and that I thought her chairs would be perfect for the area outside the kids’ playroom.Â I asked if she would consider selling me only two chairs at half the asking price — how did I have the guts to ask for that? !Â She wrote me back the same day and told me that she loved the idea of a non-profit coffee shop and that she also believed that these chairs would be perfect for us.Â She also said that we could have all three for the price I suggested for two! Her generosity was so amazing to me and I felt blessed to have made this connection.Â I was also encouraged by her reaction to our vision.Â When we went to her house to pick up the chairs I told her a little more about our commitment to the community, our support of local artists and musicians and our plans to help fund international charities.Â I wished that everyone who has played a part in building Small Ritual could have experienced her reaction and her encouragement. This is why I am writing this — so that everyone involved would know that people in our community, outside the Church at Southpoint and our supporters, are drawn to and are excited by what Small Ritual wants to accomplish. This category of our blog will hopefully be filled with stories that encourage us, assure us of God’s guidance, and connect us with Small Ritual Coffee Society. Â Please let us know if you have any stories to share. Very cool story! And very comfy chairs . . .